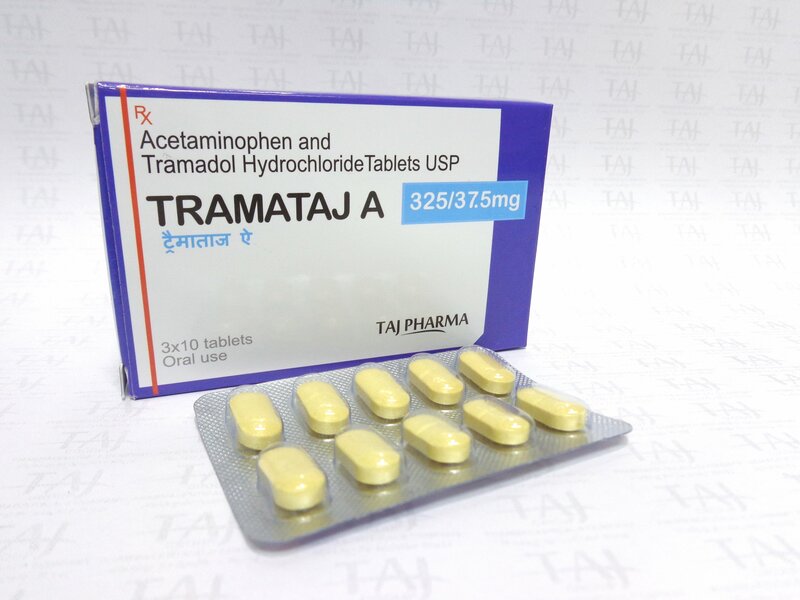 WHAT IS ACETAMINOPHEN AND TRAMADOL (TERMATAJ-A)? Tramadol is a narcotic-like pain reliever. Acetaminophen is a less potent pain reliever that increases the effects of tramadol. The combination of acetaminophen and tramadol is used to treat moderate to severe pain. WHAT ARE THE POSSIBLE SIDE EFFECTS OF ACETAMINOPHEN AND TRAMADOL (TERMATAJ-A)? WHAT IS THE MOST IMPORTANT INFORMATION I SHOULD KNOW ABOUT ACETAMINOPHEN AND TRAMADOL (TERMATAJ-A)? Do not take more of this medication than is recommended. An acetaminophen and tramadol overdose can damage your liver or cause death. The maximum amount of acetaminophen and tramadol is 2 tablets per dose, or 8 tablets per day. You should not take this medication if you are allergic to acetaminophen and tramadol, if you are intoxicated (drunk), or if you have recently used narcotic pain medicine, a sedative or tranquilizer, medicine for depression or mental illness, or any type of street drug. Do not drink alcohol while you are taking acetaminophen and tramadol. Alcohol may cause a dangerous decrease in your breathing when used together with acetaminophen and tramadol. Alcohol may also increase your risk of liver damage while taking acetaminophen. Acetaminophen and tramadol may be habit-forming and should be used only by the person it was prescribed for. Never share this medication with another person, especially someone with a history of drug abuse or addiction. Keep the medication in a place where others cannot get to it. WHAT SHOULD I DISCUSS WITH MY HEALTHCARE PROVIDER BEFORE TAKING ACETAMINOPHEN AND TRAMADOL (TERMATAJ-A)? if you have taken an MAO inhibitor such as isocarboxazid (Marplan), linezolid (Zyvox), phenelzine (Nardil), rasagiline (Azilect), selegiline (Eldepryl, Emsam), or tranylcypromine (Parnate) within the past 14 days. Talk with your doctor about your individual risk of having a seizure. a history of depression, mental illness, or suicide attempt. FDA pregnancy category C. It is not known whether the combination of acetaminophen and tramadol is harmful to an unborn baby. Tramadol alone may have caused serious or fatal side effects in newborns of mothers who used the medication during pregnancy or labor. Tell your doctor if you are pregnant or plan to become pregnant during treatment with acetaminophen and tramadol. Acetaminophen and tramadol can pass into breast milk and may harm a nursing baby. Do not use this medication without telling your doctor if you are breast-feeding a baby. HOW SHOULD I TAKE ACETAMINOPHEN AND TRAMADOL (TERMATAJ-A)? Take exactly as prescribed by your doctor. Do not take more of this medication than is recommended. An overdose of acetaminophen and tramadol can damage your liver or cause death. Follow the directions on your prescription label. The maximum amount of acetaminophen and tramadol is 2 tablets per dose, or 8 tablets per day. Acetaminophen and tramadol should not be used for longer than 5 days in a row. Acetaminophen and tramadol can be taken with or without food, but take it the same way each time. Do not stop using this medicine suddenly, or you could have unpleasant withdrawal symptoms. Ask your doctor how to avoid withdrawal symptoms when you stop using acetaminophen and tramadol. Keep track of the amount of medicine used from each new bottle. Acetaminophen and tramadol is a drug of abuse and you should be aware if anyone is using your medicine improperly or without a prescription. WHAT HAPPENS IF I MISS A DOSE (TERMATAJ-A)? Since pain medicine is taken as needed, you may not be on a dosing schedule. If you are taking the medication regularly, take the missed dose as soon as you remember. Skip the missed dose if it is almost time for your next scheduled dose. Do not take extra medicine to make up the missed dose. WHAT HAPPENS IF I OVERDOSE (TERMATAJ-A)? Seek emergency medical attention or call the Poison Help line at 1-800-222-1222. An acetaminophen and tramadol overdose can be fatal. Overdose symptoms may also include drowsiness, shallow breathing, slow heartbeat, extreme weakness, sweating, cold or clammy skin, feeling light-headed, fainting, seizure, or coma. WHAT SHOULD I AVOID WHILE TAKING ACETAMINOPHEN AND TRAMADOL (TERMATAJ-A)? Acetaminophen and tramadol may impair your thinking or reactions. Be careful if you drive or do anything that requires you to be awake and alert. WHAT OTHER DRUGS WILL AFFECT ACETAMINOPHEN AND TRAMADOL (TERMATAJ-A)? Cold or allergy medicine, sedatives, sleeping pills, muscle relaxers, and medicine for seizures, depression or anxiety can add to sleepiness caused by tramadol. Tell your doctor if you regularly use any of these medicines, or any narcotic pain medicine. drugs to treat high blood pressure or a prostate disorder, such as alfuzosin (Uroxatral), doxazosin (Cardura), prazosin (Minipress), terazosin (Hytrin), tamsulosin (Flomax). This list is not complete and other drugs may interact with acetaminophen and tramadol. Tell your doctor about all medications you use. This includes prescription, over the counter, vitamin, and herbal products. Do not start a new medication without telling your doctor.